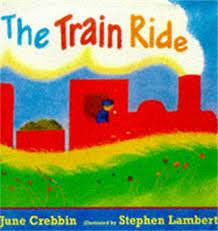 This picture book tells the story of a little girl who goes on a long train journey to visit her grandma by the sea. During the journey she talks about all the things she sees on the way. The story has a clear rhythm echoing the movement and sound of the train. The strongly rhythmic and rhyming text make it a great read aloud and fun to join in with. Read aloud and talk about the book As you read the book aloud pause at the first page to talk about it. Where might the little girl be going? What she might see on the way? Continue reading the story emphasising the rhythm of the train as you do. Pause again when the train arrives at the station (Here is the station- who shall I see?) so that your child can guess who might be waiting. Join in When you re read the story your child could join in with the repeated refrain ‘What shall I see?’ and ‘That’s what I see’. They might enjoy accompanying the rhythm of the words using a percussion instrument or improvising with a shaker made from a plastic bottle and dried beans. Using a toy train or other vehicle, a train track or bricks and toy animals and figures you could help your child set out the scenery in the story to recreate the journey. Print off the rhyming pairs sheet and follow the instructions to play a matching game. Print off and play the Train Ride track game together.